BELIZE CITY, Thurs. Apr. 28, 2016–Over the past two months, the Financial Intelligence Unit (FIU) wrapped up two court cases in which a total of four persons were fined for attempting to leave the country with a huge stash of cash without making the necessary declarations to Belizean authorities. In the first instance, Manish Perswani had BZ$37,000 seized from him after pleading guilty on March 8, 2016, to trying to leave Belize with US$47,100, according to an official source. Perswani had declared that he was leaving Belize with more than BZ$10,000 but still violated the ban Belize has had on travellers taking more than BZ$20,000 in cash out of the country. Police reportedly nabbed him at the Philip Goldson International Airport after finding him with the money, along with smaller amounts of cash in other currencies. In the second instance, Maria Jose del Valle Rosado was nabbed along with Nair Balam and Wilfredo Catzim, before their flight out of Belize. 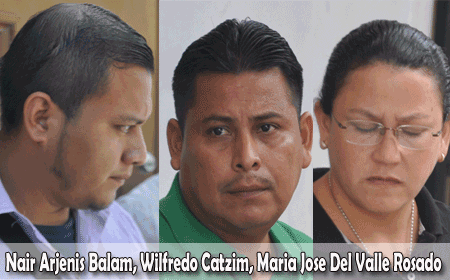 Rosado allegedly had on her US$137,130, while Balam had on him US$9,900 and Catzim US$9,800. Initially, they pled not guilty to failure to declare their cash but returned to court on April 15, 2016 with a guilty plea. Balam was fined BZ$9,800 while Catzim faced a fine of BZ$9,760. Meanwhile, Rosado had BZ$80,000 forfeited from her for failure to declare the funds and she faced a further fine of $10,000 for leaving with funds exceeding the legal limit of BZ$20,000. Since these two cases arose, though, the laws, first proposed for amendment when the House met in early March, have been amended. The amendments to the Money Laundering and Terrorism (Prevention) Act and the Customs Regulation (Amendment) Act, which are now in force, firstly remove the ban on travellers leaving or entering Belize with more than BZ$20,000. Secondly, they raise the threshold at which travellers need to disclose their cash holdings and source of funds from BZ$10,000 to BZ$20,000. Leni Ysaguirre McGann, the FIU’s Legal Officer, explained to Amandala that the changes came into force on April 14, 2016. “There was a prohibition on leaving with more than $20,000 in cash and negotiable instruments, notes and coins. That has been repealed,” she explained. McGann said that the threshold was raised in line with international guidelines. The US, for example, has a threshold of US$10,000, equivalent to BZ$20,000. For clarity, all travellers who have the equivalent of BZ$20,000 or more on them are still required to file a declaration with Belizean authorities, also stating the source of those funds. Persons carrying that value on pre-paid cards will now also be required to file declarations. Previously, inbound travellers filed declarations with Customs and outgoing travellers with the FIU. With the recent amendments to the law, travellers can now make all their declarations, on both entering and leaving Belize, with Customs officials at ports of departure, at the airport, and at northern, western and southern land borders. The FIU would retain its jurisdiction to prosecute violations, in line with anti-money laundering legislation. Earlier this year, the FIU and the Belize Customs Department signed a memorandum of understanding for mutual assistance and the automatic sharing of information.